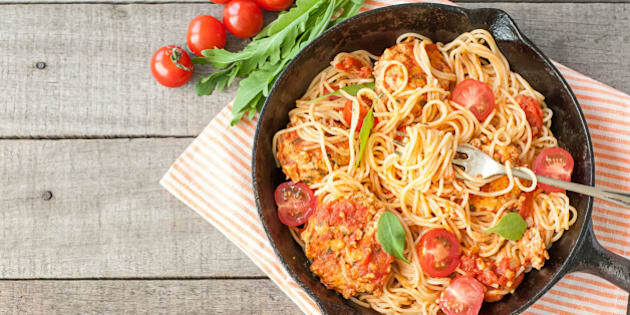 Sure, pasta fits into a healthy 80 Twenty lifestyle, but the common complaint from pasta lovers trying to watch their waistlines is difficulty controlling portion sizes. A cup of pasta looks a little sad when compared to the amount you would typically serve yourself. Especially when you compare to restaurant portions which can be 6 cups of pasta or more! When I speak to clients about their favourite comfort foods, pasta almost always makes the list. We crave carbs for their serotonin boost, quick energy and nostalgia. 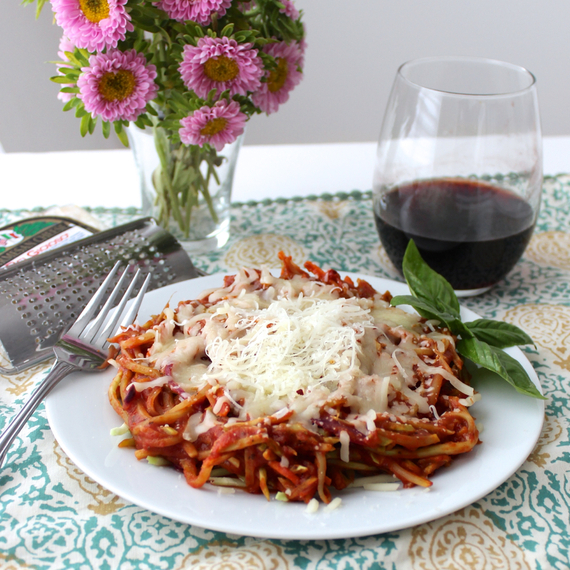 You might think about spaghetti and automatically be transported back to the family dinner table. It's no wonder you crave oodles of noodles after a long day. (Photo credit: Nicole via Flickr). The solution? There are a few. If you can use a smaller plate or bowl you'll eat less. You can also measure out your pasta portion and then fill the rest of your bowl with sauce loaded up with vegetables and lean protein. This will serve the dual purpose of tricking your eyes into thinking you're eating more and filling you up for fewer calories. 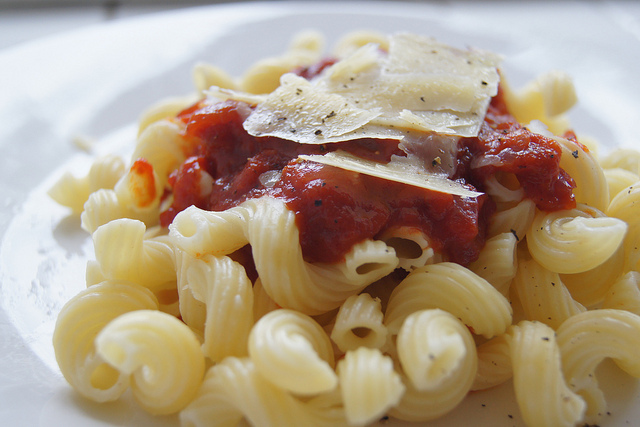 You can also try some lower calorie pasta substitutions for those days when you want a large portion without guilt. Here are my favourite lower calorie pasta subs that also happen to boost nutrition because they're all vegetables! These are great gluten-free, low carb or paleo options if you're following one of those plans. Konjac is a root vegetable from East Asia that is rich in glucomannan, a fibre that helps keep you full for very few calories. 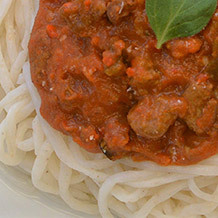 Pasta made from konjac such as nuPasta has 1/10th the calories of regular pasta so you can enjoy a 210 gram plate of pasta for only 25 calories (rather than 300 calories in regular pasta). It's also gluten-free and may help lower LDL cholesterol levels, control blood sugar and promote weight loss. (Photo credit: nuPasta. Used with permission). 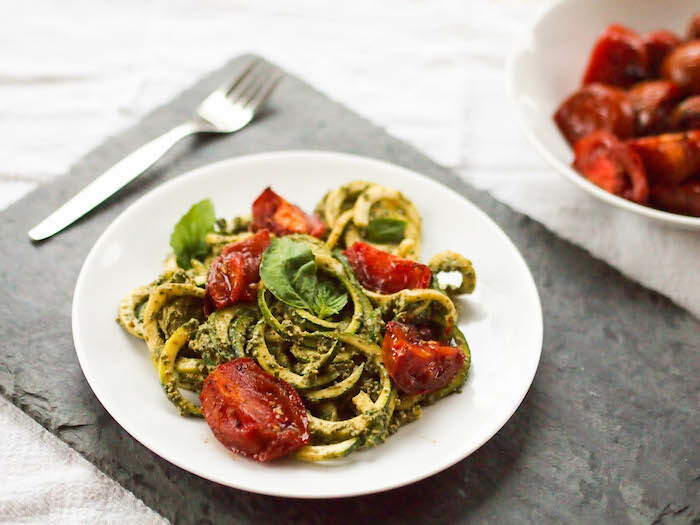 Did you know you can make noodles (popularly referred to as zoodles) out of zucchini using a kitchen gadget called a spiralizer? Sliced zucchini also works well as a substitution for flat noodles in lasagna. Replace 1 cup of pasta with zucchini and you're getting 30 calories instead of 200. Zucchini is a very good source of fibre, containing 2.5 grams per cup. Some of this fibre is in the form of pectin, which may help keep blood sugar and insulin levels within healthy ranges. Zucchini is rich in lutein and zeaxanthin, antioxidants which help protect the eyes from cataracts and worsening eyesight due to aging. 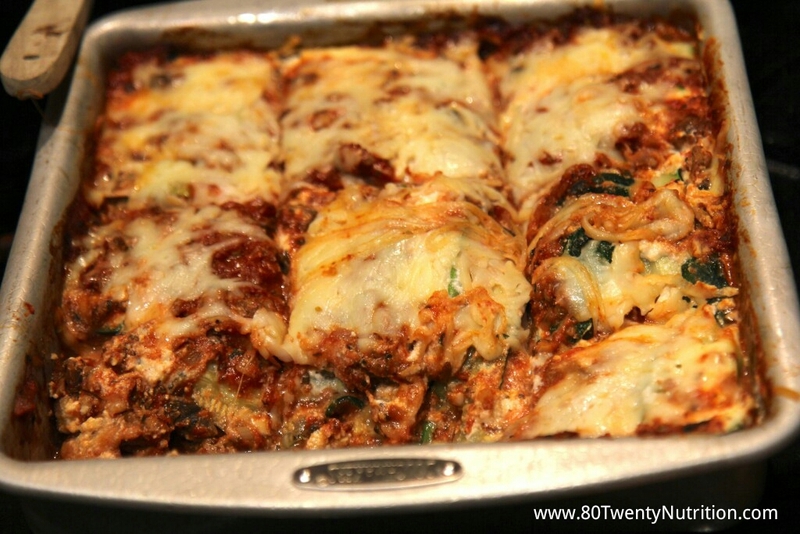 Skinny Zucchini Lasagna - Low Carb and Gluten-Free from 80 Twenty Nutrition. Zoodles with Creamy Vegan Pesto and Roasted Tomatoes from Avocado a Day Nutrition. (Photo credit: Avocado a Day Nutrition. Used with permission). 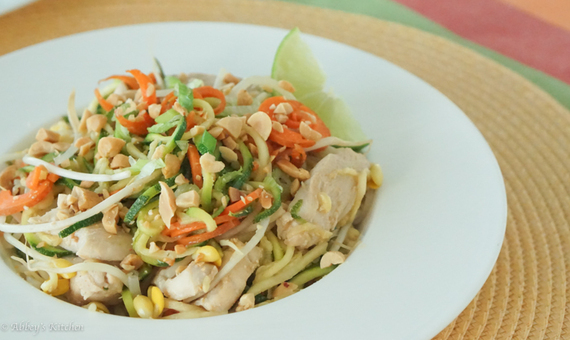 Healthy Pad Thai with Zoodles from Abbey's Kitchen. (Photo credit: Abbey's Kitchen. Used with permission). Do you eat the crowns of your broccoli and throw away the stalks? Reduce food waste and create a lower calorie pasta option by grating broccoli stalks to create broccoli slaw! You can also buy ready-to-use bags of broccoli slaw for a quick and easy option. One cup of broccoli slaw has about 25 calories and is just as plentiful in B vitamins and fibre as the florets. B vitamins help turn your food into energy and the fibre in broccoli can help lower colorectal cancer risk. Broccoli Slaw Spaghetti from Meme Inge. (Photo credit: Meme Inge. Used with permission). This stringy squash is the perfect texture to sub in for pasta for fewer calories. In one cup you're getting 42 calories, about 1/5th the calories for the same amount of pasta. 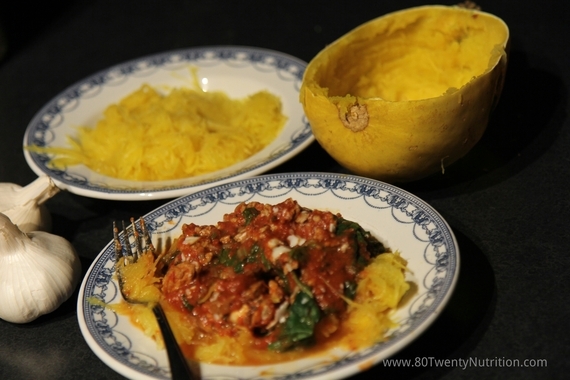 You can roast your spaghetti squash or steam it in the microwave while you prepare your sauce. Spaghetti (Squash) Turkey Bolognese from 80 Twenty Nutrition. (Photo credit: 80 Twenty Nutrition. Used with permission). 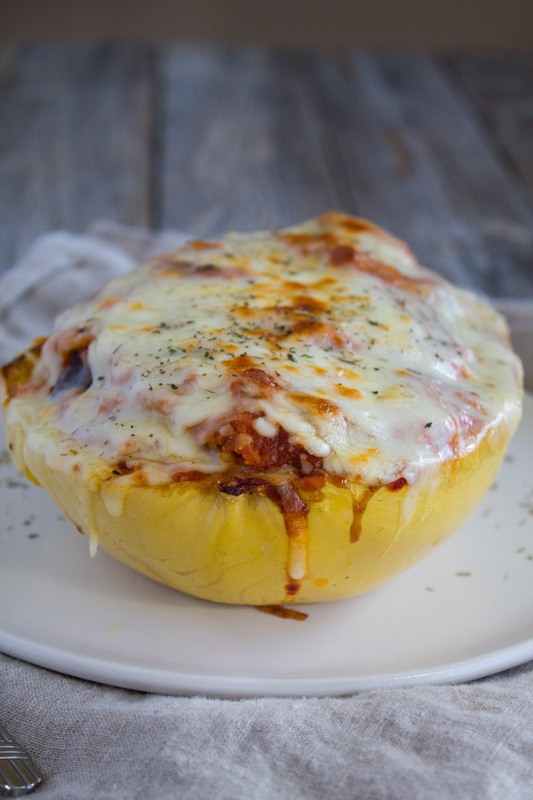 Eggplant Parm Spaghetti Squash Boats from Kara Lydon. (Photo credit: Kara Lydon. Used with permission). What's your favourite pasta swap for fewer calories? Join the conversation on Facebook at 80 Twenty Nutrition! Disclosure: Christy received compensation from nuPasta. As always, all opinions are 100% her own and all facts are evidence-based.